In the 26 years since Cambridge Carnival’s inception, it has outgrown a Central Square location and become the largest festival in the city. The festival is both competitive for the performers and convivial for the attendees. The organizers aim to ensure Central Square’s historical connection with the Caribbean remains strong in a fast-gentrifying community. On River Street, people bring out their chairs to watch the beginning of the parade. Williams emphasized that, although gentrification remains a concern of hers in terms of “how our community is shifting,” Carnival remains a culturally significant “homecoming” for many black people — including those who continue to live in Cambridge and those who have since moved out of the city. Elton’s description of the festivities was apt. Many scantily clad black men and women braved unexpectedly sharp winds on a 70-degree day, whining to soca, reggae, and dancehall on the grey Cambridge streets. One group competing in beige shiny bikinis and feathered swan wings danced in circle formation. They called themselves “Dhalpuri” after the flavorful flat bread concocted in the 19th century by Indians and Africans in the Caribbean. A confection, by themselves and for themselves. I only approached Elton because I was born in Trinidad and Tobago — the name his hat declared in silver-plated letters. Carnival too was born in T&T, with its characteristic calypsonian sound, when the cultures of African, Indian, and Caribbean immigrants collided in the 17th century. Many of its references remain familiar to me since I previously attended similar festivities, both in the island nation and in my adopted home of London. I cannot lie — knowing that a cultural artifact has spread across the world from my country, 1.3 million people strong, ensures that I feel pride in claiming it as a national heritage. When I arrived at Cambridge Carnival, I saw Haitians, Dominicans, Jamaicans, Barbadians, Grenadians and more with their flags on show. Fittingly, I quickly bought a T&T flag from a street vendor and tucked it into my back pocket. Diners brunching in cafés looked on bemused, unknowingly missing out on the Caribbean food that was being sold further down in the parade. Pholourie, doubles, rum cake, aloo pie, and the aforementioned dhalpuri roti — the soothing smell of dishes that make me feel both instantly hungry and instantly at home. The only Harvard students I saw at the event, freshmen Mason T. Forbes ’22 and Asa P. Coleman ’22, had come for the music and jerk chicken after Forbes’ brother’s friend from Dorchester told them about the event. 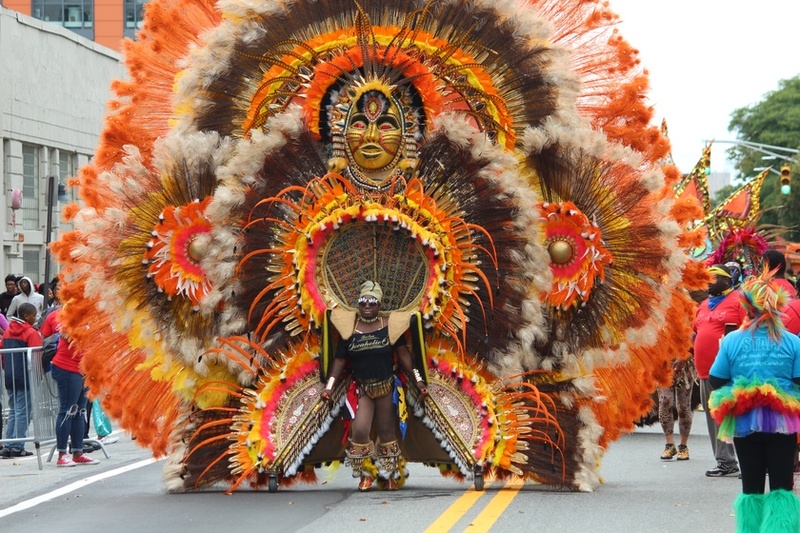 Cambridge Carnival uses the Trinidadian model of parading and open dance but retains elements specific to the city. “There is a huge participation with the Haitian community, for example the Rara group that come with their percussion,” said Williams. But to say that the Carnival’s unofficial slogan of “beauty in diversity” was fulfilled would ignore the dearth of white Cantabridgians at the event. While Walter notes that her credentials as a scholar of African Dance meant no one “has ever questioned” her place as a judge, most of the few white people at the event belonged to three noticeable constituencies: families, photographers, and the police. Kyle Mangione-Smith, a film student at Emerson, remarked on how the Carnival stood out of the ordinary run of events in the city. “Cambridge isn’t a colorful place,” he said, in reference to both its fashion and people. In reference to the high number of police officers present, Williams said that there were “more than you would probably want to see,” but emphasized that “public safety is a number one priority for us.” From 2004 to 2007, Williams worked as a creative consultant for Notting Hill Carnival in London. Upon her return, she helped the Cambridge Police Department develop a public safety plan for the following years of the event. On Carnival day, members of the organizing committee were stationed with police in their command center. “They are constantly in communication with us, because we are in charge of the event and they are there to support us,” she says. —Magazine writer Che R. Applewhaite can be reached at che.applewhaite@thecrimson.com.